Lt. Gov. Evelyn Sanguinetti and state health officials visited Waukegan on Friday to discuss the opioid crisis and learn about Lake County’s efforts to battle substance abuse. Sanguinetti also was scheduled to be among the featured guests at a $100-a-plate fundraiser for the Lake County Republican Federation on Friday night in Lake Forest. 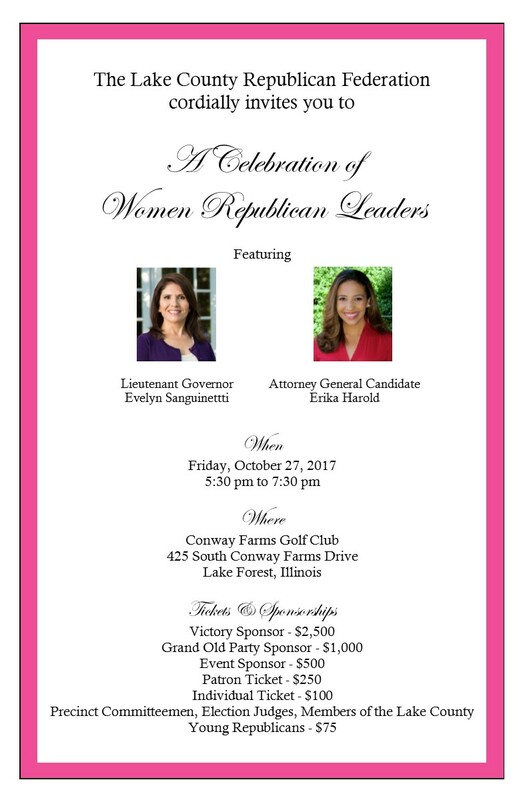 The Lake County Republican Federation announces their fall event, A Celebration of Women Republican Leaders, will take place on Friday, October 27, 2017 at Conway Farms Golf Club in Lake Forest, Illinois. The cocktail reception begins at 5:30 p.m. and features Illinois Lieutenant Governor Evelyn Sanguinetti and Illinois Attorney General candidate Erika Harold. Various former and current Lake County women elected officials will be recognized, as well as candidates who are circulating petitions for the 2018 Republican primary in March. The Lake County Republican party has a long history of including women in all aspects of their organization. From State Senator Adeline Geo-Karis to former Lieutenant Governor Corinne Wood, to former Comptroller Leslie Munger, Lake County Republican Women have been at the forefront of public service and leadership locally and statewide. The goal of this celebration is to raise the funds necessary for a successful 2018 election campaign. Proceeds will be used towards grassroots organizing efforts, upgrading technology, maintaining Lake County Republican Headquarters, and providing staff support for the Lake County GOP. The Lake County Republican Federation has provided service to the community, candidates, and local elections for over fifty years. To learn more about how you can contribute with your time, talent, or treasures, visit www.lcgop.org or call Erin Westphal at (847) 680-6680. Tickets are $100 per person. Additional sponsorship opportunities are also available. For further information or reservations, please contact Erin Westphal at (847) 680-6680 or email erin@lcgop.org. This month we welcome Chris Kasperski as our guest speaker. Chris is the President of the Lake County Young Republicans and the owner of the political consulting firm, Franklin’s Key. He will be talking about the results of the 2018 General Election in Lake County and improving our results in the future. This should be an interesting discussion. Please join us! Our meetings are open to all Republicans. Refreshments follow the conclusion of the meeting.